The most feminine of MCMC Fragrances’ collection, Kept is romantic with hints of rock n’ roll. 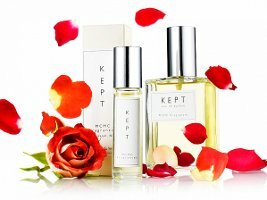 The long-lasting fragrance is built around red roses and black tea, with subtle notes of clove, leather, and amber. wow, spaced out description… I don´t see the causality or relation between freedom and the “key” tattoo… perhaps is to break the locks of dependency from the (figurative) men that “kept” her? I hope it is something like that, because it might well have been “Inspired by this notion, she goy a Krusty the Clown tattoo on her forhead, a bottle of tequila and a bucket of buttered salted popcorn”. It would make the same sense to me! SOrry I am cranky today hehehehe. The notes sound very interesting, and I haven´t heard (or payed attention) to MCMC before… perhaps that was the goal of the dreamy prose! to get our attention! WIN! I wasn’t at all interested in this scent until I read your post! Somehow “Krusty the Clown tattoo etc” is going to stick in my head until I sniff this! I’m not getting the “key = independence” symbolism either. However, the notes sound lovely. I doubt a sample will drop into my lap, but if it does, I think I’d enjoy. I love the notes too…. also will find more about the house. If you’re going to get a Krusty the Clown tattoo, then the bottle of tequila makes a lot of sense. The notes actually sounds kind of interesting, although roses are usually my nemesis. But a Rose that works for men is a holy grial I am searching. I am beginning to differentiate between the different Rose smells, bulgarian, turkish, etc. I keep trying to get my husband to wear that sample of Czech & Speake No. 88. Or my Gres Cabaret, which I don’t find girly at all. His bottle of Acqua di Gio is running low, so he might be more open to trying new stuff soon! It is not my favorite back story ever. But roses & black tea sound good! Indeed! I will try this if it gets in my hands. I noticed a couple of interesting scent descriptions for MCMC Fragrances at indiescents, and have them on my “to sniff” list–“Garden” (like a fresh leaf cut in half) and “Noble” (where vetiver and jasmine duke it out for your attention in some sort of noncohesive-cohesive way?). How utterly stupid, not to mention nonsensical. Good thing I don’t need the ad copy to be good, or I would certainly ignore this one. The notes do sound promising, though, so I’d love to smell it…if, of course, it fell in my lap. Ditto on the ad copy — it isn’t that important to me. Just seemed that way because it didn’t take me much thought and no time at all… just came up with it… but hey, thanks! I respect this line, I really do, since it’s so artistic and charitable. HOWEVER, I have sampled only one, Humanity, and I really didn’t care for it. It smelled a lot like a Body Shop oil I used to wear as a teenager but no longer appreciate. Mmm. Cloves and roses. Of course leather always works for me. Love the idea of the roll-on oil. Will have to check this out. I love the cloves & roses combo. It sounds yummy. I am familiar with MCMC and glad to see it mentioned here. I love their “Maine” fragrance as well as “Maui”, although the “Maui” tends to start out smelling a bit like the “Wicked Wahine” of my youth.